That's too funny, don't you love stumbling upon odd stuff and having your camera with you! Thank you for sharing on Weekly Top Shot #67! Such beautiful, soft shadows wandering round the lonely shoe! Atmospheric photo! And love the last line of the haiku! Another great post! I especially like the haiku! Interesting shot on the last one Carol. Enjoyed my daily walk with you---art.....photos of town...haiku.... what more could I need! I presume the direction would be away from the wolves, right? good you had your camera with those two odd happened-upons! I think I shall take your quote for the day for inspiration for myself. OK? Cool shots! Looks like you and ArtMuse Dog stumbled upon some interesting things on your walk! I like your ink drawing and the haiku! Nice haiku on Wolf Moon Carol ... feels really good to follow the howling of the wolves to the celestial realms. 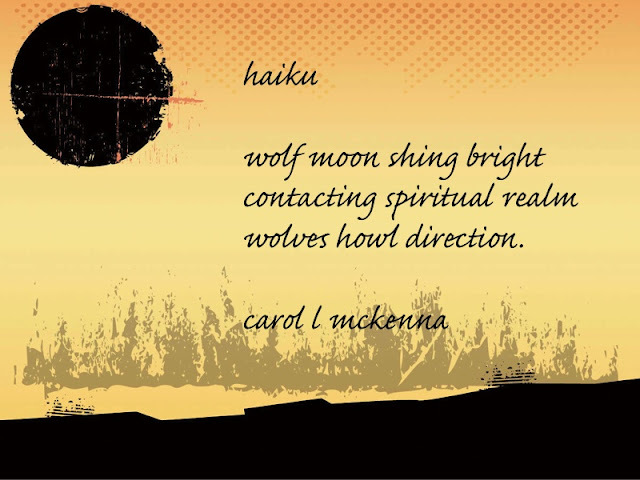 Another beautiful sketch, photo, and a wonderful haiku, Carol! Even tho it's a clog...the surrounding area of your shadow shot...well, it looks way too cold for me!! By the way, love the pen and ink sketch...cute!!! Enjoyed all the unique photos & sketches. that has to be a happy dog by the beach, nice painting! Lovely haiku and photos too. Enjoyed your creativity Carol, and I don't think Artmuse Dog looks at all ferocious- just the opposite in fact. Great photos. Love your drawing of art muse dog, so cute. 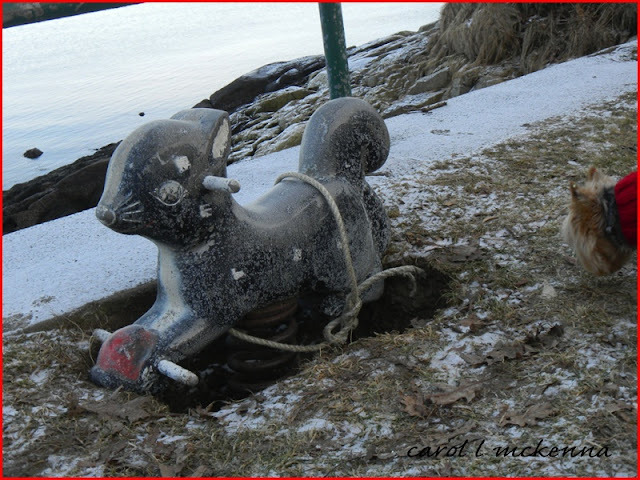 I love seeing all the curiosities you and muse dog find during your walks. I think his little portrait is cute. Blessings! Fun Stuff! Loving your sketch of art muse doggie...too darn cute! I especially like that dark sandal with the red behind it. wonderful color mix and feel. Happy Sunday Sketching! Oh she doesn't look ferocious at all!! The moon sure is beautiful right now - it's huge! I love how you share so many different talents each week. You and ArtMuse certainly share a wonderful and creative life. 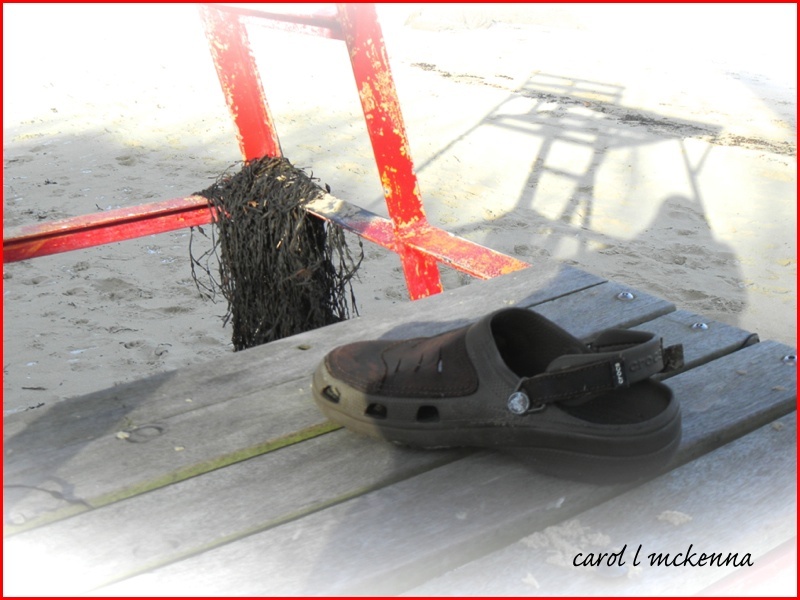 Oh yeah, that croc shot tells a good story! Love your photos - especially of the shadows! I think your sketch is wonderful! You had some interesting finds that day! I think the drawing is wonderful. Great post! I happen to really like that sketch, I think it is really cute.